The president of a Las Vegas police union is disputing claims by a Seattle Seahawks football player that he was racially profiled when he was handcuffed and detained following an active shooter report last month. "Our officers did not detain Bennett because he was 'a black man in the wrong place at the wrong time,'" Las Vegas Police Protective Association President Steve Grammas said in a letter to NFL Commissioner Roger Goodell Thursday. 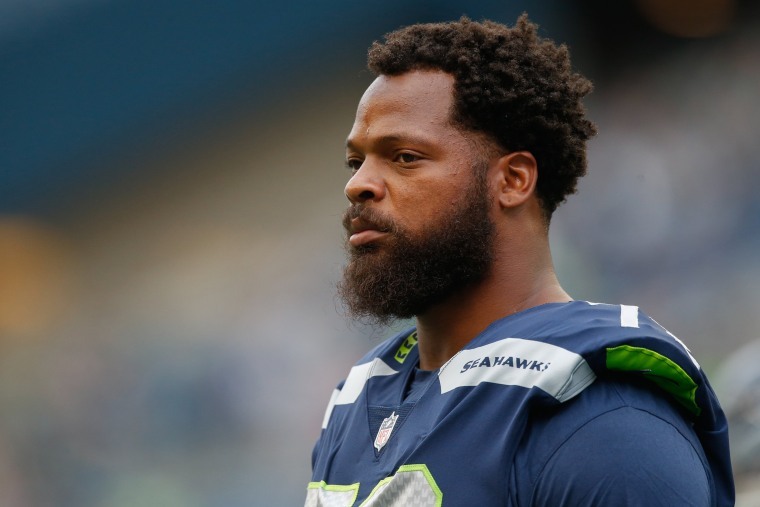 Michael Bennett, a defensive end and a two-time Pro Bowler, said on Twitter Wednesday that an officer "warned me that if I moved he would 'blow my f---ing head off'" and that he was racially profiled when he was handcuffed and detained following a report of an active shooter at the Cromwell Hotel and Casino. The union called for Goodell to investigate the "obvious false allegations." NFL spokesman Brian McCarthy said there is no basis for such a probe. "There is no allegation of a violation of the league's personal conduct policy and therefore there is no basis for an NFL investigation," he said in an email Thursday. There were no shots fired, and the report of an active shooter turned out to be unfounded, police said. The Las Vegas Metropolitan Police Department has said an internal investigation is underway. Police department Undersheriff Kevin McMahill played body camera video at a news conference Wednesday he said showed the chaotic scene as officers responded to the shooter report early Aug. 27, which occurred around three hours after the Mayweather-McGregor boxing match. According to McMahill, Bennett was arrested because officers who were sweeping an area near a nightclub found a person crouched behind a gaming machine. The person, later identified as Bennett, ran out of the south doors and jumped over a wall onto Flamingo Road, causing officers to believe he may have been involved, McMahill said. The football player was handcuffed and held for 10 minutes and then released, he said. McMahil said Wednesday that he has seen no evidence race played a factor in the incident. Bennett said that he wondered if he'd be killed, and in the statement posted to Twitter Wednesday mentioned the controversial police shootings of other black men and children by police, including Michael Brown and Tamir Rice. He said he was subjected to "abusive conduct" by the arresting officers. "I didn't ask for this moment, it just happened to be me. I'm just lucky to be here to be able to speak about it," Bennett said at a media availability Wednesday. The president of the Las Vegas Police Protective Association said in the letter to Goodell that any claims of racism are false. It said both the officers involved in Bennett’s detention are minorities. McMahill said both officers involved are of Hispanic origin. He did not name the officers Wednesday. "Our officers responded to one of the most dangerous calls a law enforcement officer can be assigned — an active shooter firing rounds in a crowded casino," Grammas wrote in the letter. He said that Bennett’s actions, specifically running from the casino and jumping over a barrier wall, caused officers to focus on him as a potential suspect. Police video shown by McMahill Wednesday showed several people running from the casino as police arrived, and officers telling people to move. In video of the Bennett’s arrest posted online by TMZ Sports Wednesday, Bennett is heard saying he didn’t do anything wrong. "I was here with my friends. They told us to get out — everybody ran," he said. Both officers involved in the arrest had their handguns drawn, McMahill said. McMahill said that there are at least least 126 videos associated with body and other cameras police have to review, and urged the public to turn in any video they may have recorded. He said if any policies or training were violated the officers would be held accountable. Investigators will look at why the arresting officer did not have a body camera activated, McMahill said.